Sounds, 4th November 1989, "Tongues Untied"
AFTER A ten year slog, Biting Tongues have arrived at the right place at the right time. 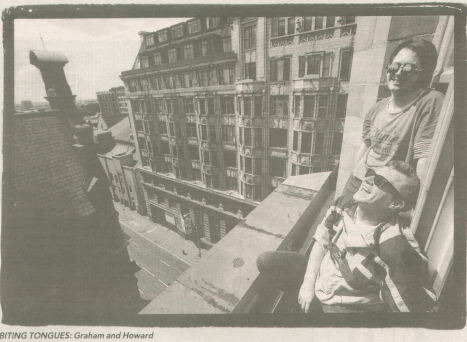 Spending most of the '80s on the fringe of the muzak scene, the core duo of Graham Massey and Howard Walmsey have passed through several different shades of noise combat. And Massey's recent involvement with 808 State seems to have heralded this Tongue revival. Hooked up with the currently happening Cut Deep label, a stable that includes the mysterious chimes of Sons Of Arqa, the sampling mischief of Mighty Force and a whole zoo full of sound guerillas, the Tongues are ready to move in. After dabbling with the avant garde their music has become a lot more dance orientated – a style that fits them more comfortably than some of their past twisted experiments. "We always felt that we related a lot more to black music rather than industrial music," Massey explains softly. "I never liked the term industrial; it implied a coldness that we never felt that we really had. "Biting Tongues have always made colourful, exciting, exotic music. Give any kid access to technology and the end effect will rely on his imagination. "I mean, we are not new to this sampling thing. A lot of our work has been a precursor to this. On our first album we were using cut-up tapes to achieve the same effects." The single `Love Out' has already enjoyed some daytime radio play and with the delayed `Recharge' album ready to be thrust in our faces, the band seem set for some sort of breakthrough. Even so, they may have to be content for the moment with sitting in the shadows of the gloriously ascendant 808 State whose molten sound is dazzling. BITING TONGUES are the arch exponents of the death-to-the-band syndrome. Why lumber yourself with some fatso chewing up some crud bassline and a beer-stained monster on drums? "What we've learned on our travels is that technology is a great help. Before you always had to get a band with a drummer in it. We had to take a course in engineering in the end. After that we were in the driving seat all the way. I mean, we were trying to audition bass players and there just weren't any." Not that this plinkety plonk computer keyboard racket is a free ticket with instant entry to an expanding aural adventure. No sir, a large proportion of this stuff allows the bankrupt of talent to produce some mind-numbing post-Gary Numan style robotic crap. Being modern and having a sampler is too easily mistaken for being on the right track – bub! But with `Recharge', the Tongues have successfully avoided those pratfalls and hit some fairly spooky moments on their dark dance groove trip. "There will always be boring guitar bands, and there will always be people who think that technology will be safe enough. But it will always be down to your imagination."